Anton Paar is an established leader in providing unique solutions to the analytical testing challenges faced by the wine industry. We offer a wide variety of equipment capable of an easy density and brix check on your fermenters, accurate alcohol monitoring from must to finished wine, and CO2 and DO measurement from tank to bottle. Anton Paar has wine insight from the process line to the lab. Call (800) 722-7556 or email info.us@anton-paar.com to learn about Anton Paar's solutions for the wine industry. Anton Paar USA is an EEO/AAP employer. Lyza 5000 Wine is Anton Paar’s novel solution for fast multi-parameter analysis in wine production, wine laboratories, and filling plants. Highest precision, a multitude of parameters, fast measurement times, and the user-friendly touchscreen interface are the essential components of the instrument that has been tailor-made for the wine industry. Alcolyzer ME provides the same high accuracy and same ease of use as the established Alcolyzer ME models, with one extra benefit: now you can use one alcohol meter to measure all your beverages, including: beers, ales, beer mixtures, alcopops, ciders, molasses, whisky, cognac, brandy, vodka, gin, tequila, rum, wash, RTDs, white wine, red wine, sparkling wine, rice wine and fermenting musts. The DMA™ 35 Basic portable density meter measures the density and concentration of your sample and is characterized by the highest level of user friendliness. Its robust and lightweight design enables on-site operation in a wide range of work environments. Use the Alcolyzer Wine M/ME wine analysis system to determine the alcohol content of your wine quickly and easily. When combined with a density meter, Alcolyzer Wine M/ME determines further parameters in a single cycle, e.g. extract content. The patented NIR measuring method eliminates the influence of other sample constituents on the alcohol measurement and therefore guarantees highly precise results. 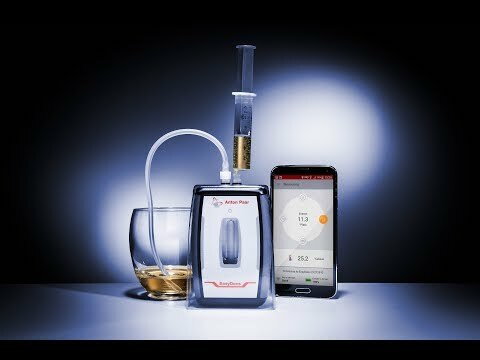 EasyDens determines your wort\'s extract content, the sugar content in your home-produced fruit juices and the alcohol content in spirits with no sugar added. The EasyDens also monitors the fermentation process of your wine via a daily measurement of apparent extract or sugar and visualizes the process in a fermentation chart. With its robust and maintenance-free design, simply apply quick and reliable measurements using only 2 mL of sample. The SFD Sparkling Wine Filling Device transfers sparkling wine or wine directly from a closed bottle into the measuring chamber of a measuring instrument. The SFD Filling Device is equipped with a drilling device that penetrates traditional corks and most plastic corks. CboxQC™ At-line is the combined portable CO2 and O2 meter for measurement directly from process lines, tanks, kegs and casks during production and bottling.The integrated CO2 and O2 Data Logger function enables continuous measurements from the line or tank. CboxQC™ At-line is ideal for checking the production process of beverages and verifying the CO2 and O2 results measured by process equipment. Anton Paar’s patented* innovations offer you true values: on any beverage – at any time. With the new Carbo 520 Optical inline sensor you always know the actual CO₂ concentration of all beverages in your process. In addition to process monitoring, the measuring interval of 4 seconds enables a reliable and stable closed-loop control of carbonators. 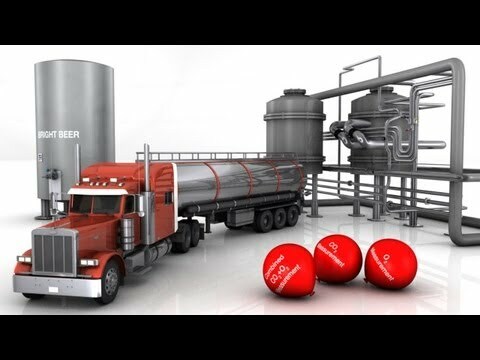 At-line instruments from the measurement experts: Whether from process lines, tanks, kegs or casks, at-line measurements provide the assurance that your production process is under control. Anton Paar offers an at-line CO2 meter as well as a combined CO2 and O2 meter for use at the line, delivering accurate results in 90 seconds only. 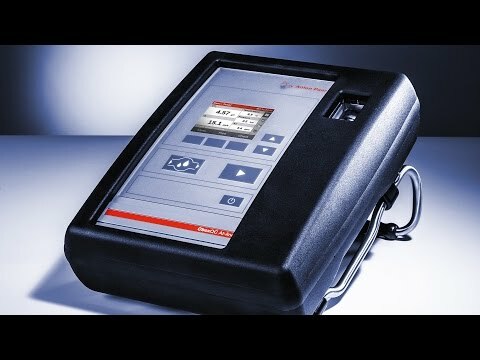 Watch this video for an introduction to these robust, powerful at-line beverage analyzers from Anton Paar. With the new Carbo 520 Optical inline sensor you always know the actual CO₂ concentration of all beverages in your process. CboxQC™ At-line is the combined portable CO2 and O2 meter for measurement directly from process lines, tanks, kegs and casks during production and bottling. Anton Paar invites you to the 2019 DMA 35 Service Days in California. Drop off or pre-ship your Anton Paar DMA 35 to have it repaired or serviced by one of Anton Paar's Certified Service Team members. Your free advance VIP Guaranteed Service Ticket will ensure same-day repair so that you can leave the event ready to measure! Walk-ups are welcomed, but only those with VIP Guaranteed Service Ticket registrations are guaranteed to receive same-day turnaround service. Registration is free. You must complete the VIP Guaranteed Service Ticket in its entirety to be counted as registered. Complete your VIP Guaranteed Service Ticket! Anton Paar will also have DMA 35 accessories and consumables available onsite for purchase. Questions? Email service.us.west@anton-paar.com, or call 804.550.1051. Can't make it? Find the latest DMA 35, along with accessories and consumables from Anton Paar, at shop.anton-paar.com. More than 13 parameters in one go: Receive results including ethanol concentration, sugars, and acid profile as well as density and pH values in one measurement run. Minimum measurement time for quick results: Increase the throughput in your lab significantly with measurements in less than one minute and Lyza 5000 Wine’s connection to an Xsample 520 sample changer. Stand-alone instrument for independence: Lyza 5000 Wine is equipped with a 10.1” touchscreen. Start measuring right away with the most intuitive user interface in the market. Connectivity to Anton Paar benchmark instruments: Lyza 5000 Wine connects to Anton Paar instruments such as density meters, alcohol meters, pH meters, and turbidity meters, creating the most powerful measurement system for wine analysis. Receive an all-in-one report after only one sample preparation, one filling, and one measurement. Highest precision in the wine market: Accurate cell temperature control of ±0.03 °C and the innovative 12-bounce ATR-measurement cell ensure the highest precision of your measurements. Flawless operation: Integrated workflows guide the user through ethanol and water reference measurements. Live notifications keep you informed about the state of the instrument at all times. Anton Paar DMA 35 Service Days in California - coming in June! Anton Paar invites you to the DMA 35 Service Days taking place June 4th and June 6th in California! Drop off or pre-ship your Anton Paar DMA 35 to have it repaired or serviced by one of Anton Paar's Certified Service Team members. Your free advance VIP Guaranteed Service Ticket will ensure same-day repair so that you can leave the event ready to measure! Walk-ups are welcomed, but only those with VIP Guaranteed Service Ticket registrations are guaranteed to receive same-day turnaround service. Registration is free. While you're there, check out the famous Anton Paar Mobile Lab, a 200-square foot rolling show vehicle that has been customized to create a complete hands-on demonstration and learning environment. Anton Paar will also have DMA 35 accessories and consumables available onsite for puchase. Questions? Email Stephanie Gurka, or call 804.550.1051. *Full Calibration and Maintenance cost includes cleaning of density cell and hand pump with replacement of all consumables in addition to the adjustment and calibration of your unit. This will ensure your DMA 35 is back to factory standards. For a limited time only, Anton Paar is offering FREE sensor insurance on DMA 35 Standard Version handheld digital density meters! This offer only applies orders made on the Anton Paar Webshop. DMA™ 35 is a portable density and concentration meter you can take along for quick quality checks directly on-site. Years of experience in concentration and density measurement, thorough research, and a quest for perfection have led to the creation of a portable density meter that is built to excel in your environment. A splash-proof housing, gesture control for one-hand measurements, wireless data transfer, and the smart positioning of the oscillator will get you the most accurate and reliable results, regardless of the conditions. We at Anton Paar stand firmly behind our products and do not make empty promises. This is why for a limited time DMA™ 35 comes with an exclusive lifetime sensor insurance when purchased online. If for any reason the measurement cell of your device should break, Anton Paar will cover all replacement costs, guaranteeing a lifetime of highly accurate, reliable results – and peace of mind. Visit Shop.Anton-Paar.com for more information! Wine is not a drink. And one of the most important questions is: how to keep fermentation under control? One answer is density measurement. In the world of density measurement grape juice is considered to be a sugar-water solution, which means that winemakers can measure the sugar concentration in their juice with the help of a density meter. All other components – besides sugar and water – that are present in the juice have so little effect on the density that they do not influence the measured result in any way. The sugar concentration in the grape juice is the main factor influencing the alcohol content of the final wine. By measuring this sugar concentration winemakers can already predict the alcohol content of their future wine before the fermentation has even started. Furthermore, in many countries the sugar concentration is decisive when classifying the product as quality wine or ordinary table wine. During fermentation the sugar turns into alcohol and CO2, so fermenting wine is considered a three-component solution made of water, sugar, and alcohol. From a theoretical point of view this would be the end of the story in which density plays the hero’s role, but in reality that’s not the case! Winemakers follow the decrease of density during fermentation in order to judge whether the fermentation proceeds as planned. Due to the influence of alcohol this value is called ‘Apparent Sugar Concentration’. Carrying out proper fermentation control is one of the most important quality control tools a winemaker has as only a finely tuned alcoholic fermentation will reveal all the grapes’ hidden aromas. Winemakers can immediately step in if they see that the fermentation is proceeding too quickly – which could lead to lost aromas – or is about to stop unexpectedly. By adjusting the temperature of the fermentation tank it is in most cases possible to lead the fermenting wine back on track. In more challenging cases a ventilating tank-to-tank transfer might help. A fermentation which is completely stuck can only be reactivated by inoculation with fresh yeast. However, this yeast has to deal with difficult conditions as the nutrients have already been consumed by the first yeast. Furthermore, the ratio of glucose to fructose is not ideal as the glucose necessary for activation of the fermentation might already be exhausted, too. Having these facts in mind, we clearly see that prevention is better than cure. To summarize: dealing with the natural process of fermentation does not mean we cannot use tools to help us keep control. Fermentation control is one of the decisive factors for obtaining the wine you intended to produce. However, all methods of density measurement – be it conventional methods like glass hydrometers or digital density meters – are strongly influenced by the CO2 present in the fermenting sample. Of course samples can be degassed to reach a correct result, e.g. by putting them into an ultrasonic bath, via shaking the samples and snifting to release the CO2 or by stirring – although this will not be very convenient if a winemaker has 100 tanks to be measured once a day. Here are two quick options for a successful measurement on fermenting wine with digital density meters. The portable density meter is simply turned 90 ° counterclockwise so that all bubbles move in the same direction – to the position in the glass measuring cell where bubbles have the lowest influence on the result. Furthermore, by holding the instrument in this position during your everyday measurement, the results are comparable from one day to the other. And the ultimate benefit is: The winemaker can stay in an upright position :o) unless measuring tasks are seen as a fitness workout! Another possibility is to use the syringe filling option: the instrument is prepared for syringe filling (the adapter is usually included in the delivery) and the sample is degassed directly via syringe with the help of creating underpressure. Simply fill the syringe with sample, close the syringe tip with your finger and pull the plunger and remove your finger from the tip. Enjoy the “plop!” sound telling you that the CO2 is leaving your sample. Repeat this routine 3 times. Again you are ready to take a repeatable measurement. RFID – that’s not a robot from Star Wars but a technology helping winemakers to quickly identify their tanks before they do a density measurement for the purpose of fermentation control. RFID stands for Radio Frequency Identification and is also commonly used for e.g. container tracking in logistics, goods tracking in supermarkets, and for personnel cards. An RFID tag programmed with a unique sample name is attached to the wine tank or barrel. The density meter reads this tag before the measurement and identifies the name of a sample in a second. Especially when handling a large number of tanks or barrels each day this kind of quick sample identification adds up to an enormous time saving. As the sample ID is saved with the measured values, results are traceable no matter how many different instruments and operators are involved in the measuring process. Not bad, especially if you have to measure hundreds of samples a day. Frequently, sulfurization is applied to wine to preserve the color and taste, enhance stability, and avoid any bacterial spoilage. Sulfurization is usually done in the form of a stabilization solution that has to be adapted based on the volume. To see whether the stabilization solution has the correct concentration, again a density meter can be used. Based on the density result you can determine the concentration of two-component solutions like liquid sulfur dioxide. Many analytical labs specialized in wine analysis offer a comprehensive analysis of the wine including alcohol, extract, SO2, acids, pH, and more – an analysis that bigger wineries will even do themselves. For a smaller winery, doing such an analysis means sending a certain amount of sample to the lab that will charge for the respective analysis package ordered. Sophisticated instrumentation based on FTIR or NIR technology are used for the measurements and these instruments are usually capable of measuring several parameters in one go (see e.g. the Alcolyzer Wine Analysis System from Anton Paar. In several countries these official labs will be the ones providing their results for the purpose of issuing a national test number, showing the consumer that the wine has undergone official tests. 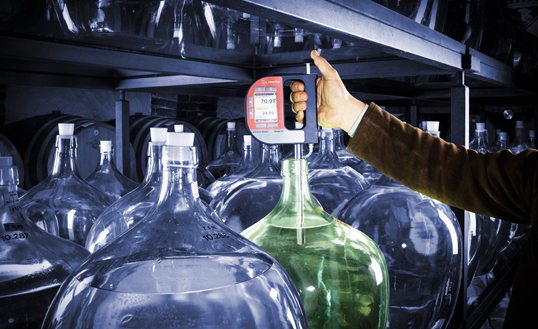 Learn more about the DMA 35 Portable Density Meter, an instrument that will do hundreds of fermentation checks a day for you and supports all well-known winemakers worldwide in their production process. Would you like a quotation for a portable density meter tailored to your needs? Contact us! As always in life, investment in equipment for a professional lab is assessed under the key aspect of profitability. While the variability of equipment will generally be high, space and money are limited and the investment must cover present and future needs. A well-designed lab offers countless analytical methods that have to be used in an efficient way. When it comes to cost, not only the one-time investment but also running expenses such as consumables and also salaries are considered. The tendency to want to decrease payroll requires either the reduction of the number of staff, doing without educated chemists – or in the worst case both. However, this trend does not necessarily mean that the operation of equipment becomes easier at the same time. Lab staff has to handle more and more complex instruments and although preparatory work such as sample collection, identification, and preparation as well as the subsequent tasks of data collection and distribution can be standardized this is difficult with the measuring and analysis steps as they frequently differ greatly. Purchasing as much equipment as possible from the same producer. Brand recognition and similar operation procedures reduce complexity and result in less training required for the lab staff. Choosing providers of analytical instrumentation that make sure differences in the user interface, operation, and maintenance of their products are only marginal. All required analytical parameters are measured at the same time and in parallel. Automatic sample handling reduces potential human errors. Once a measuring process has been started, lab staff is free to work on other important tasks. If in the future the need for another measuring parameter arises, the extension of the existing measuring system is easy-going. This also serves a limited budget, i.e. a measuring system must not be purchased at once but can be extended on a yearly basis. All measured data is processed via the same interface, be it a printer, USB storage device, LIMS service, or the touchscreen of the master device. At Anton Paar the subject of “modularity” all started with an innovation for the beverage industry. In soft drink production sugar content and CO2 content were measured separately in the lab with two independent instruments. The launch of the PBA-S system united the density meter for measuring sugar content and the carbonation meter for measuring CO2 with automatic sample preparation. Suddenly, sample throughput was doubled and the operator was only required to use one single interface. Time savings were tremendous. From left to right: DMA M density meter measures density and converts this into °Brix (sugar concentration); CarboQC determines CO2; PFD filling device automatically fills the beverage directly from the container with no need for prior degassing. The demand for low sample volume led to the integration of one measuring parameter into existing instruments with a plug-and-play concept. The increasing workload of staff created the need for automatic sample changers. Some measuring modules were even developed without a user interface when it was obvious that they would always be used with another (master) device. 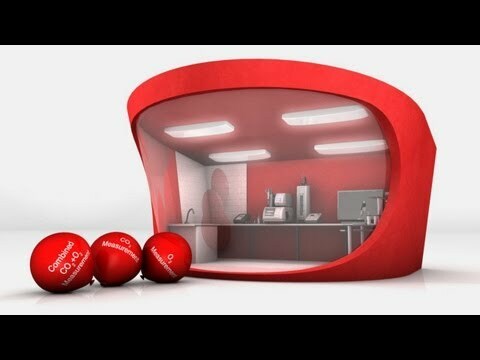 Again this meets the challenge of limited space and also reduces production cost. Expensive or limited sample quantities required compact and space-saving measuring equipment. Certain industries were consistently drawn to certain combinations of devices. These are now often sold as packages. The operator benefits from ease-of-use and reduced time required for each measurement task. The decision-maker saves money due to optimized processes and efficient use of time and resources. The instrument producer can cut down on production costs, leading to less expensive products. A small winery in central California found a way to speed up managing the daily workload without compromising on the quality of analyses and cultivation. Portable instrumentation helps cope with the daily inspection of the checkpoints and allows for continuous monitoring of the progressing development of the wine’s characteristics. In the small city of Lodi in the northern part of California’s Central Valley, around 65 miles east of San Francisco Bay, the Bear Creek Winery (see Fig. 1) cultivates its fine assortment of wines. The area around Lodi is blessed with a very steady growing season. Although it experiences some heat spikes, conditions are excellent for growing wine grapes because of a phenomenon called the “delta breeze”. As the warm air rises in the evening, cool air is drawn in from San Francisco Bay and makes the Lodi region experience a very large difference in temperature between day and night. The diurnal change is excellent for grape growing and that is what makes the Lodi region stand apart. Bear Creek Winery was founded in 1934 and has been owned by the Kautz family since 1997. John and Gail Kautz were instrumental in opening up certain grape varieties in Lodi. They were the first to plant Chardonnay and Cabernet Sauvignon and they are also the largest growers of Cabernet Franc and Symphony. Despite the Kautz’ success story Bear Creek Winery still remains a family organization, setting an example of how upholding tradition and moving with the times can be combined. At Bear Creek Winery they grow between 40 and 45 thousand tons of grapes a year that are turned into red wine varieties such as Cabernet Sauvignon, Merlot, Syrah, but also more unusual varieties that are mostly used for blending, such as Sousão or Tannat, and white and blush wines such as Chardonnay, Sauvignon Blanc, and a Shiraz/Cabernet Sauvignon rosé. The white and rosé wines are primarily processed in an atmosphere where oxygen is excluded at all times by driving the air out with CO2. “This provides a reductive style that the Bear Creek Winery takes a pride in,” says Michael Borboa, Export Winemaker, who studied at Fresno State University. “The reductive atmosphere can be seen by the green color of the juice because the oxidative browning that causes the wine to turn amber is minimized,” he explains. At Bear Creek Winery comprehensive quality control is performed throughout the entire production process. The final products in particular undergo close examinations of residual sugar, volatile acids and malic acid. The alcohol content is measured using an Alcolyzer alcohol meter by Anton Paar which is based on a near-infrared method (see Fig. 2). SO2 and O2 determinations are also on the agenda as well as the occasional test for filterability. In recent years, Bear Creek Winery has found an even better way to manage the daily workload by using a portable density meter for quality checks. This reduces the time spent checking tanks and is much easier to use than a hydrometer. Quality control during fermentation in the wine tanks plays a very big role at Bear Creek Winery. Here, a small portable density meter, a DMA 35 by Anton Paar, proved to be the ideal companion that makes daily work much easier. Before acquiring a DMA 35, the operators had to carry a basket containing a hydrometer with the required accessories up to the top of the tanks to perform the measurements. This tedious work is now a thing of the past: The DMA 35 density meter has made the hydrometer obsolete. Now, quality control personnel do not even need a clipboard and pen because the measuring result is automatically recorded by the DMA 35 density meter. At some stages there are between 50 and 100 fermenters that have to be checked twice a day. While it used to be common practice to spend maybe 10 or 15 minutes for one tank sample, nowadays with a DMA 35 a check takes only 3 to 5 minutes per tank. This saves a lot of time and effort and allows the winemaker to take action faster if needed to ensure that the health of the wine is maintained. Radio-frequency identification (RFID) allows wireless data transfer between tags and devices with an integrated RFID interface. RFID tags are commonly used for identification purposes in many industries and have also found their way into wineries due to their ability to uniquely link the measured characteristics of a certain product, for example a fermenting wine, to the location where the sample was taken – usually a barrel or tank, where the tag is attached. The DMA 35 version “Tag&Log” is equipped with an RFID interface with a reading range of about 2 cm. Installation of the tag is an easy and straightforward task as can be seen in Fig. 3, Steps 1 and 2. The instrument provides the ability to program an RFID tag with a sample name and also method settings for the measurement of that very sample. For the day-to-day routine, the tag is scanned before the measurement (compare Fig. 3, Step 3) in only one second. If required, settings can also be erased and programmed anew. Measured data are stored in the DMA 35 including the identification information. Wireless data transfer to a computer or printer is done with an infrared interface (IrDA). Quick sample identification at numerous measuring points within a winery means enormous time savings. The density measurement with DMA 35 takes less than a minute, and the instrument reads an RFID tag and identifies the name of a sample in only one second. Portable density meters not only come in handy at the tanks for determining the sugar concentration in the grape juice and the decrease of sugar during fermentation, they are also used for checking the sugar content and ripeness of the berries. Density measurement is also employed to check on the right concentration of dissolved SO2 to be added as a stabilizing agent to the wine. Another positive aspect of the DMA 35 density meter is the calculation of filling volumes from the weight before shipping the wine to the customer. Currently Bear Creek Winery is experiencing a distinct trend for sweeter wines. As Michael Borboa explains, “Nowadays, younger drinkers seem to prefer sweeter wines. There has been a tendency in the last few years for wine that has been traditionally dry to be produced sweeter.” Confirming this trend, Borboa mentions the increasing popularity of Muscat or Moscato in the United States. Young drinkers are choosing this floral, semi-sweet wine and making it very fashionable. The use of new technology, such as DMA 35 with RFID interface, has made Bear Creek more efficient and more progressive. The scene is set for the continued success of Bear Creek’s remarkable high-quality wines. Even though Michael Borboa has recently moved on to new responsibilities outside of Bear Creek Winery, he still takes to using Anton Paar instrumentation at his new job as Senior Winemaker. In the production of alcoholic and non-alcoholic beverages, it is essential to check and control the CO2 and O2 content of the product both during the production process and after bottling. The CO2 content strongly influences the taste of beverages and is a considerable cost factor in beverage production. Precise measurement of the carbon dioxide ensures consistent taste and cost-efficient dosing. Whether directly at the production line, in the laboratory or as part of a larger beverage analyzing system, Anton Paar provides the best instrument for your measurement application. The range includes instruments for measuring dissolved oxygen and dissolved carbon dioxide without being influenced by other dissolved gases such as air or nitrogen. Anton Paar’s new instrument, CboxQC, combines the fast measurement of CO2 and O2 in one measuring cycle – available for portable use at-line as well as in a standalone version for the laboratory. For the utmost flexibility, the instruments’ new and robust design is small, compact and lightweight. Alcolyzer ME requires minimal adjustment and delivers highly precise results for all beverage types. Simple adjustment with water/ethanol solutions covers all products in the groups "Beer", "Wine" and "Spirits"
When combined with a density meter, Alcolyzer Wine M/ME determines further parameters in a single cycle, e.g. extract content. The patented NIR measuring method eliminates the influence of other sample constituents on the alcohol measurement and therefore guarantees highly precise results. The new L-Dens 4X7 series of sensors are highly accurate, durable and maintenance-free. They have low integration costs and low operating costs and provide density results at 4-digit accuracy. The L-Dens 4X7 density sensors are for use in the petroleum, chemical and beverage industries. The wide range of L-Dens 4X7 sensors includes different materials, process connections and electrical interfaces to suit each plant. Process control and monitoring supported by continuous density measurement with L-Dens 4X7 sensors increases a plant’s productivity. With L-Dens 4X7, the consumption of raw materials and energy is optimized and the production runs at maximum capacity. It's called the Snap 50. With a measuring accuracy of 0.1 % v/v alcohol, Snap 50 is the most accurate digital portable alcohol meter available on the market. The portable alcohol meter Snap 50 measures distilled spirits in all strengths within seconds: from pure distilled spirits to samples taken during watering down to drinkable strength and ready-to-drink spirits. A few milliliters of sample are taken from the storage tank or cask and measured directly on-site. The alcohol meterautomatically compensates the temperature influence on the result and shows the alcohol concentration with an accuracy of 0.1 % v/v on the large display. There is no need for any extra calculations – just read off the values, store them or send them to a PC! Winegrowers value being completely in charge of their production – as it’s their decision-making, their personal touch that gives good wine its character. A new alcohol and extract meter for wine, Alex 500 from Anton Paar, gives you the power to have in house information. 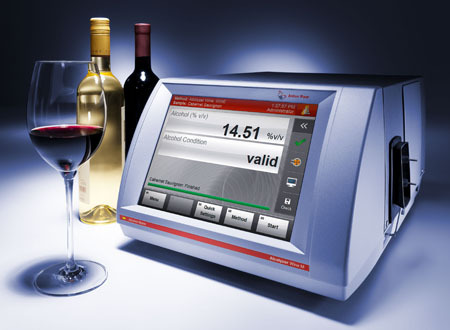 The reliable lab-grade analyzer determines their wine’s alcohol and total extract content whenever they wish. Now easily able to monitor their entire production from grape to bottle, wine producers can always be sure to keep their customer promise. Checking the alcohol concentration is part of the daily routine in small distilleries. Often traditional measuring methods such as glass hydrometers are in use, despite being difficult to use and having a tendency to break. Now, two new products from Anton Paar are about to turn this situation around. In time for the high season at distilleries, Anton Paar presents a new series of attractively priced digital alcohol meters which will pay for themselves in a very short time, even at the smallest distillery. The Snap alcohol meters check the alcohol content of two-component mixtures made of water and ethanol over the whole relevant measuring range from 0 % v/v to 100 % v/v. They therefore replace all glass hydrometers in use at small distilleries. The sample is taken directly from the storage vessel, the influence of temperature on the result is automatically compensated and the alcohol concentration is displayed within seconds. With a measuring accuracy of 0.1 % v/v alcohol, Snap 50 is the most accurate digital portable alcohol meter available on the market. With its capability to identify sample names via RFID (Radio Frequency Identification), store more than 1000 results, and print or export these to a PC, Snap 50 provides complete traceability of the results. With the new Snap 40 Anton Paar makes cutting edge technology available for a very economic price and allows very small distilleries to move into the digital age. The measured results are accurate to 0.2 % v/v. Snap 40 provides less features than Snap 50 – this model cannot save results, for example. Snap 40 is exclusively available via the Anton Paar Webshop. Combining cutting-edge technology in a robust and long-life instrument, the new Snap alcohol meters give distillates from small distilleries, which are produced with great passion for detail, the quality they deserve. The Craft2Craft Cases guarantee precise fermentation control, high shelf life stability and the great, consistent taste of your products. The cases include the DMA 35 density meter and the CarboQC At-line|CboxQC At-line|OxyQC CO2 and oxygen meters. The DMA 35 portable density meter determines the extract content in beer wort and can also be used to closely monitor the fermentation process. The CO2|O2 meters for measurements at tanks and out of packages offer the simultaneous determination of CO2 and O2 and an insight into the amount of nitrogen in beer. Results are delivered within a few minutes – this system proves indispensable even in the smallest of breweries. Click here for more information about the Craft2Craft promotion. Out with the old and in with the new! Get a jump on your spring cleaning and leave your lab sparkling with Anton Paar’s trade-up program: Users can trade in any manufacturer’s refractometer or polarimeter to receive a 50 % discount on a brand new Anton Paar Abbemat refractometer or MCP polarimeter*. Act now! This attractive offer is valid for a limited time only. 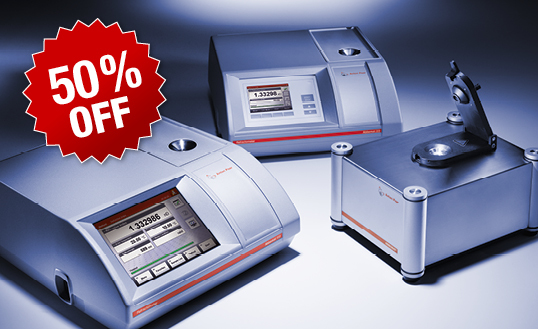 The MCP series from Anton Paar is the most powerful polarimeter series on the market. The versatile instruments provide the highest measuring accuracy, maximum user-friendliness and full compliance with all relevant international standards (Pharmacopoeia, OIML, ASTM). The instruments’ greatest strength is their robust and modular design, supported by state-of-the-art data management. Anton Paar’s range of Abbemat refractometers embodies over forty years of technical expertise. They measure the refractive index and concentration of liquids, gels and solids. These truly universal refractometers cover all applications in all industries. An Abbemat is a secure investment for the future, providing reliable and accurate results for years to come. For a limited time only, Anton Paar’s special trade-up program now provides these high-quality instruments at an amazing price. Spring cleaning has never resulted in more sparkle than this! Interested? Email us at: optotec.us[at]anton-paar.com. DMA 35 Overall Protection: New rubber housing available! "Is a rubber housing available for DMA 35? 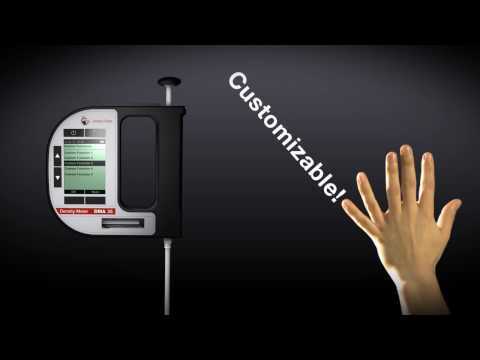 ": This is the most frequently asked question concerning the DMA 35 portable density meter. Now we can finally answer with "YES, there is!". The rubber housing protects the instrument in case of collisions or shocks. For ideal protection, use the optional shoulder strap in addition to the rubber housing. Please note that the rubber housing is still no guarantee against breakage of the instrument's glass measuring cell in case the instrument is dropped. Anto Paar USA has released a new social media campaign designed to engage with users of our products by providing them with relevant, meaningful information about their industry and the solutions that we offer. Join us on Facebook, LinkedIn, Twitter, and Google+ for the most up-to-date company and product information, industry news and articles, application reports, expert opinions, and much more! multi-parameter FTIR analyzer Lyza 5000 Wine is your solution for the analysis of wine. Use the wine analysis system Alcolyzer Wine M/ME to determine the alcohol content of your wine quickly and easily. When combined with a density meter, Alcolyzer Wine M/ME determines further parameters in a single cycle, e.g. extract content. solution for the measurement of turbidity in liquids, the HazeQC ME turbidity measuring module, is now provided by Anton Paar as part of a new modular measuring system. The most accurate density meter on the market, used in labs around the world subject to audits for taxation purposes. CarboQC is a portable and robust meter for beverage analysis. It gives you fast, accurate and reliable determination of dissolved carbon dioxide in beverages. Analyze spirits efficiently and economically in the laboratory and at the production line using the alcohol analysis system Alcolyzer Spirits M/ME. The DMAâ&#132;¢ 35 Basic portable density meter measures the density and concentration of your sample and is characterized by the highest level of user friendliness. Its robust and lightweight design enables on-site operation in a wide range of work environments.